I’ve always been a planner and a bit of a control freak. I like to figure things out and then analyze what I’ve done. I then like to tweak my original plan and do something better than what I’ve done before. This process turns me on. I’m pretty good at it. As a school teacher, I always enjoyed developing the lesson plans more than executing them. As a homeschool teacher, I disliked textbooks and full curriculums because they robbed me of the opportunity to be creative and in control of my child’s learning. That’s why it hasn’t been easy for me to set aside everything I know and love about teaching in order to establish a more natural learning environment for my children. In fact, it took me more than 20 years to figure it out: Creating a successful and happy learning environment in my home is not about what I do, but what I don’t do. It involves stripping away pre-determined expectations and setting aside pre-conceived notions. It’s about replacing my need to teach in favor of letting my children learn. I have to trust the process and I have to trust my children. Let me clarify. When I speak of trusting children to learn, I’m not referring to their ability to follow directions, complete every assignment, or pass every test. But, what I do trust is that children of average ability can and will learn almost anything, if they have the desire and the will to do it. They may not want to learn exactly what I want them to learn and they may not want to learn it according to my timetable. But the natural learning and maturation process enables almost every child to turn their attention to the right things at the right time in order to achieve personal success. Research and history prove it. And our own common sense knows it. The folly of our current system of education is there is zero trust in children to take responsibility for learning at the needed time and place. We decide we can’t trust a student to learn how to write a research paper in college so we begin teaching him how to write one in elementary school. Because we don’t trust our children to be able to figure out math “in the real world,” we start subjecting them to difficult mathematical word and story problems when they are barely out of kindergarten. The 12-year process of preparing children for any academic eventuality so we don’t need to trust them to properly navigate college and career later on is insane. Science, history, social studies, geography, and math lessons are introduced, re-introduced, repeated, reiterated, and re-enforced year after year. Reading and writing is deconstructed and then taught in isolated, bite-sized parts we can begin pounding into the minds of young children, even though they won’t have any real interest in writing stories or reading books until much later on. We prepare kindergartners so they can do well in elementary school, so they can do well in middle school, so they can do well in high school, so they can do well in college, so they can do well in career. It’s an absurd process predicated on the belief that people can’t handle an academic or career challenge unless they have been armed ahead of time with a deep well of knowledge to draw upon. It presumes that people will wilt under the pressure of having to find solutions and it assumes they have no means by which to do so. All the while, informed people who know what they are talking about—people who research and study learning, people like educational psychologists and neuroscientists—tell us without reservation or exception that the human brain has almost unlimited capacity to learn new things when a need or desire is present. And little capacity to store (and then retrieve) information when that need or desire is missing. In other words, we spend 12 years forcing an ineffective system of information recall on school children when creating a natural learning environment that produces interested and motivated learners is far more effective. The day I set my own preconceived (and ill-conceived) notions about teaching aside in favor of the truth about how children really learn is the day our homeschool took an 180-degree turn for the better. It hasn’t been easy to be patient and trust my children and the process. But it gets easier every day. Because it has become increasingly obvious to me that natural learning works. While teaching — at least in the traditional sense — doesn’t. This past week my college-aged son, Jesse, had a doozy of a week. He had two major tests and a large presentation he had to fit in along with a multitude of other on and off-campus responsibilities. In the thick of it all, he called me and asked if I could help him study for one of the tests. I was a little surprised to get the call, but also pleased that I could help. I immediately cleared my schedule that evening and waited for my son to make the 20-minute trek home to study. First, it surprised me how little Jesse knew about basic governmental law and function. Given that I was Jesse’s homeschool teacher, I could have felt bad about that, but I refused to. I’m pretty sure I made an effort to teach these basic notions, but Jesse simply didn’t pick them up. But the second thing that surprised me was far more significant (and positive): At 21 years of age and with a difficult test staring him in the face, Jesse could learn at lightening speed. Within an hour, Jesse had mastered the information on the study guide, understood it, and could apply it. He then promptly fixed himself a snack, thanked me, and hurried out the door. Lest you think Jesse really didn’t have that much to learn in that hour, let me assure you he did. The first question in his study guide concerned the U.S. Constitution and Jesse knew little about it. The second question mentioned the “balance of power” among the “three branches of government” and Jesse had never heard of either. When I used words like “judiciary,” “executive,” and “legislative” to describe the three branches, he looked at me with blank stares. Each term had to be broken down and further explained. We pretty much had to start from scratch when it came to understanding basic governmental function. Only after he mastered the basics could he move on to the more complex Business Law principles addressed in the study guide. But what would have taken a long time to learn in fourth grade (the grade when the these concepts are typically introduced) took just a few minutes for a 21-year-old. Not only that, but Jesse immediately understood the principles involved and was able to apply them. By the end of our one-hour study time together, Jesse could explain the different facets of complicated business law cases. He could predict the outcomes of those cases based on precedent and case law. And he could identify the different schools of jurisprudence utilized by various judges and attorneys. This brings home a point I have long made: People—both children and adults—learn best (and maybe only) when they need and want to learn. Forcing children to struggle with complicated subjects like the balance of powers and constitutional law when they are 10 years old makes no sense at all. There is no interest and no ability to understand something so distantly related to the life of a child. Even memorization at this age is more difficult than it is later on. Education would be far more simple and beneficial if we let children learn at their own pace and as they encounter the need for learning. It’s funny, but my kids don’t have any trouble figuring out how to work any of our home electronics. They surf the Internet and manage social media like pros. Complicated computer gaming is a snap. They learn these things because they either want or need to. They retain the learning because they utilize it every day. This is exactly how learning works in the real world. I remember my daughter’s first day on the job in a professional position following her college graduation. Kelsey came home in a panic saying her college classes in graphic design had not prepared her for the expectations of her graphic design job. She was being asked to make decisions and do things she didn’t know anything about. So what did she do? 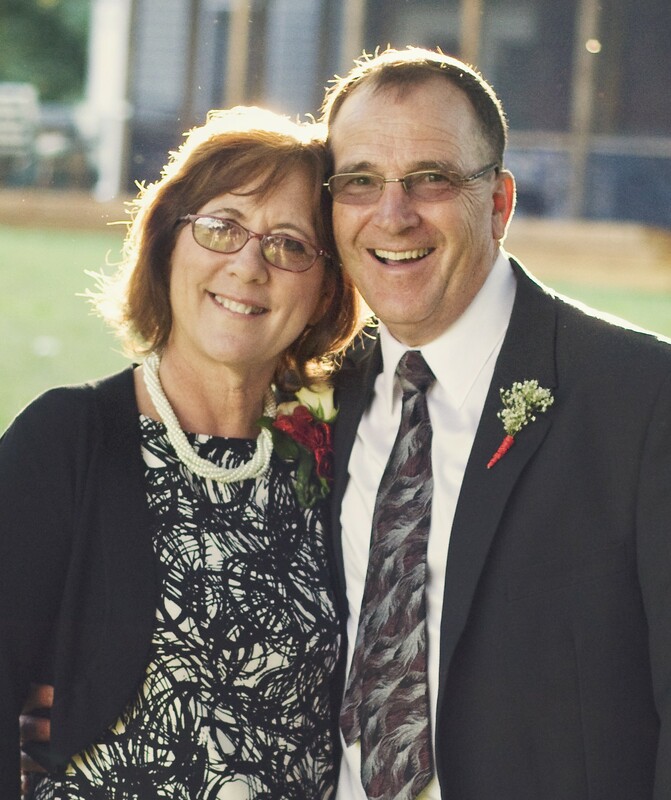 That night, her first night on the job, she desperately called a man from our church who worked in the same industry and pelted him with questions. The next day she returned to work armed with a plan. In other words, don’t spend long hours forcing children to learn things they can easily (and better) learn later on. It’s not wise to frustrate children this way and it’s not smart to waste their time either. If the subject matter is difficult and you are having to teach and re-teach, set it aside. The time is not right. Some teachers get this concept and will delay learning for awhile, but they get nervous as high school graduation nears . So they re-tackle difficult and unnecessary subject matter. They are worried about “holes” and “gaps” in education, fretting about what will happen if they miss teaching something that will come up later. Well, here’s what will happen: Your children will do what Jesse and Kelsey did. They will figure it out for themselves. They may have to do a little extra work. They may have to stay up a little later studying for a test or preparing for a work project. They may even have to call you, or another family member or friend, and ask for help. But they WILL figure it out because now, and only now, they HAVE to. That need ensures success like your random school lessons never could. 1. The rapid advances in technology have completely changed the way we live and work in the world. Almost every career field in America has been changed at its very core by the fact that computer technology can put large amounts of information and diagnostic services at the fingertips of every American. 2. To succeed in this new environment, people no longer need specialized information or skills, but the ability to select, synthesize, manage, and apply mega amounts of information quickly and wisely. The ability to do this takes smart people. It takes people who can think. It takes people with well-functioning brains. 3. To help children prepare for life and career in this new world, parents and teachers should focus on providing instruction and activities that build the brain. Recent advances in scientific brain research have made it clear how this is accomplished: Brains are built through exercise. The more the brain is utilized and the higher the order of thinking, the faster the brain functions and the bigger it grows. In other words, brains don’t just “fill up,” they expand and contract and speed up or slow down based on the degree to which they are used. 4. Therefore, in homeschooling, parents should be seeking out assignments and activities that engage and stimulate brains, spark higher order thinking, and demand as much multi-level use and quick application of brain function as possible. These kinds of activities typically do not happen in traditional classroom environments where assignments rely on one or two steps of problem solving or focus on unnecessary acquisition of knowledge readily available to students via the Internet. Brains are built far better in places like backyards, playgrounds, studios, stages, ball fields, libraries, living rooms, and even bedrooms. Because these are the places where children live, work and play. The places where children solve real problems of complexity and are inspired to imagine and create new ways of playing, living, and learning. Home schools are strongly positioned to engage in brain-building activities. Even if homeschool families teach and learn using the same methodologies employed in traditional classrooms, they are still far ahead of their public and private school counterparts because they do it for less time each day. Instead of the six-hour brain drain that most school children go through each day (not to mention the hours of homework each night), homeschool children complete their assignments in a fraction of that time. Afterward, they are free to engage in the types of activities that truly build brains. One of the most interesting research studies I encountered while preparing for this blog series involved London taxi and bus drivers, two very different occupations requiring very different skills and preparations. The difficulty of being a taxi driver in London is legend. People seeking a taxi license must demonstrate they have memorized the location of 25,000 streets and 20,000 landmarks, as well as all the routes between them. This gargantuan task is made even more difficult by the fact that London streets twist and turn and follow no grid pattern at all. After memorizing this information, London taxi drivers must employ it by picking up any number of different clients each day and transporting them to where they want to go, expertly navigating a city of 8 million people without GPS. On the other hand, London bus drivers must pass a far simpler test, and then follow it up by driving the same, simple route each day. When scientists looked at the brains of the two groups, they saw that, as a group, taxi drivers’ brains were much different from those of bus drivers. Specifically, the hippocampus in the posterior region of the brain was much larger, a critical finding considering this area is where short-term memory is transferred into long-term memory. The conclusion? When large amounts of information are sorted and applied regularly, the brain physically grows. This, in turn, increases the opportunity and capacity for even more complex learning in the future. Simply put, London taxi drivers, by virtue of their daily activities, are smarter than London bus drivers. If homeschoolers want to get smarter they should avoid the simple tasks and routine of the London bus driver and open themselves up to the complex, real world of the London taxi driver. Their brains will be bigger and better because of it. A few days ago we were driving home from a short trip to Gatlinburg, Tennessee and we got behind a U.S. Mail truck. I started thinking: Will there even be such a thing as a mail truck in 10 years? The Information Age that astounded us yesterday is being superseded by the Virtual Age, a time and place where people can no longer observe the world from the sidelines. Knowing how to interact and move forward in such a rapidly changing virtual world takes a cool head and a keen mind. This doesn’t just hold true for business and political leaders, but for parents, students, and rank-and-file employees as well. Average citizens and good employees used to be able to get by just by following rules and obeying orders. Today, they must rewrite the rules, define the questions, and innovate the answers. Change is not an easy task for conventional schools to address. Institutions don’t switch gears easily. But home schools are different. They are small and flexible and unburdened by government regulation. They are run by people known to think for themselves and out-of-the-box. Homeschools are positioned to meet the demands of the new age our children will live in. So, what are you doing different in your homeschool to prepare your children for this rapidly changing new world? A good place to start is to evaluate the kind of learning going on in your homeschool. We shouldn’t just be throwing information at our kids anymore and hoping it will stick. Our kids need to go much deeper. They need to learn how to think. 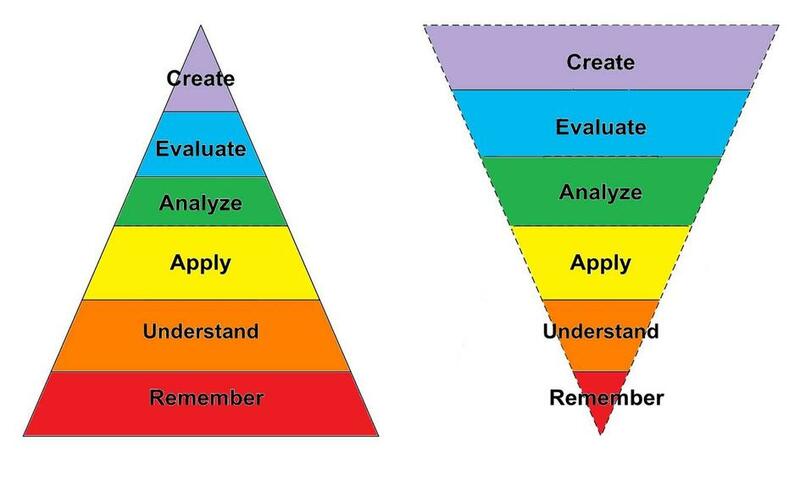 In education, we have a model for cognitive learning called Bloom’s Taxonomy of Educational Objectives. 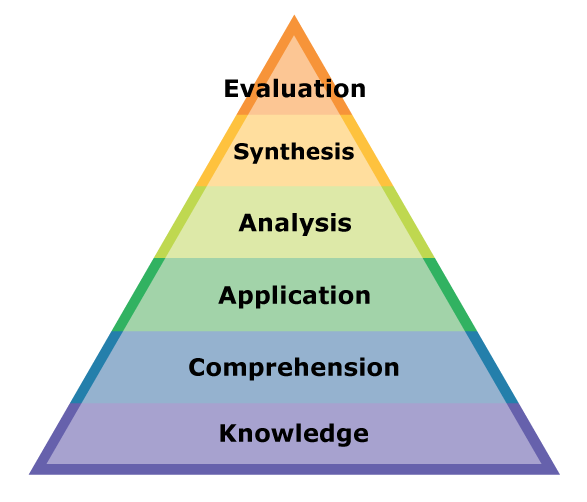 The goal of Bloom’s Taxonomy is to define the goals of education and present a hierarchy of learning that demonstrates how students should be progressing from low-level, basic cognitive tasks to higher, more complex forms of thinking. The original pyramid model (below) was introduced more than 50 years ago. Almost every trained educator has been using it in one form or another to evaluate curriculum and learning ever since. In other words, if students can memorize and regurgitate information then learning has occurred at the knowledge level. Ninety-five percent of what goes on in schools, even homeschools, happens at the knowledge level. The remainder happens at levels 2 and 3 (comprehension and application). However, in our current world, people must learn to think and function at levels 4, 5, and 6 (analyzing, synthesizing, and evaluating). There is so much rapidly changing information coming at us so fast and in so many different ways, all of it critical to the well-functioning of our businesses and homes, that we must get very good at sorting and processing. It’s the only way we can find successful pathways through the world around us and make sound decisions about the future. In response to the changing realities of the world around us, associates of Bloom have revised the original taxonomy. You can see in the new depictions below that the six levels of learning have been renamed, and the pyramid has been inverted to illustrate the need to commit increasing amounts of classroom time to learning at higher cognitive levels.